Today I want to let everyone know I changed up a bunch of my things on my home page. I put links to a lot of the most popular posts, just click on the title and it will take you there. This way new followers don’t have to read through them all. I also have included links to newspaper articles and a couple of the interviews I have done. I hope it doesn’t come off too self absorbed, that is not my intent. My buddy, Roger Wilson, sends information to media outlets and teams regarding my trip so they can get a quick snap shot of what I have been up to. If they respond I like to request “free” tickets and parking passes, it helps a lot with my expenses. 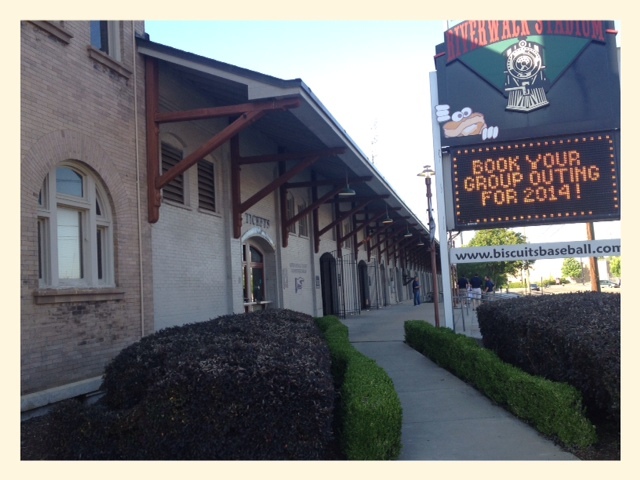 Last night, I went to the Montgomery Biscuits game and they beat the Jacksonville Suns 2-1. 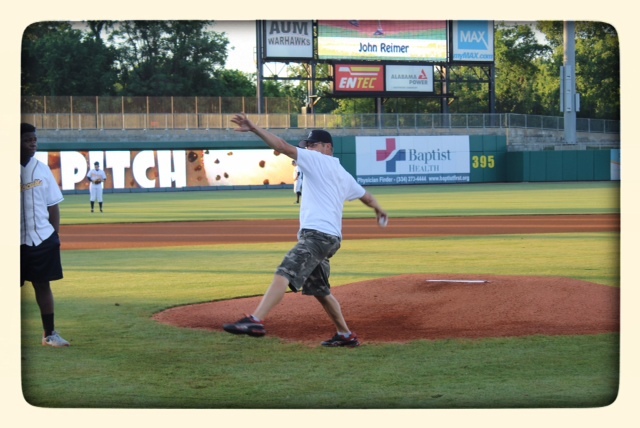 I got to throw out one of the ceremonial first pitches. I am happy to report I didn’t bounce the ball, it was a little high and inside for a right handed hitter. I did that by design since I was working on my “brush back”. Ross Winkler got me a ticket and gave me a tour of this great stadium before the game. Their stadium is relatively new, from what I recall him saying, it was built in 2004. What was so cool was an old train station was incorporated into the structure. No, not being used, not functional except as a very unique part of the stadium. Ross said, “They have the ‘old’ luxury boxes, which are in the train station and the ‘new’ luxury boxes that were built into the stadium and not part of the renovation of the train station.” Active train tracks are behind the left field wall and during the game a train rolled through making itself known. I loved this place. The site lines were great and the breeze was great coming from the river just beyond the train tracks. I am a huge fan when it comes to nostalgia (that’s why I love Wrigley and why I will “probably” love Fenway). So when stadium designers incorporate something old, I will most likely love it! Outside view of old train station. Adam Winkler, KEYE Channel 5 out of Austin, Texas did the great feature about this trip and hooked me up with his brother, Ross. I was honored and humbled by the generosity both have shown me. Adam and cameraman Anthony Geronimo continue to follow and check in on me from time to time. I must say, I am enjoying the media exposure with all the great personalities that have interviewed me. They have all been very nice and welcoming making it a joy for me. Troy LaFluer, who wrote a great story about the trip in the American Press Newspaper of Lake Charles, Louisiana, he and I keep in touch through Twitter and texting. Chris Dehring, whom I talked with while in Columbia, South Carolina, he wrote a wonderful piece about the journey. The two of us had a great “off the record” conversation about the state of baseball as we watched Lexington and AC Flora. I talked about Brendan Clarke from Charleston already and his fun personality. I was interviewed by Ron Gant of Good Day Atlanta at the Gwinnett Braves complex. It was fun to meet Ron and get to talk with him about his baseball career. Jeff Haeger from Hattiesburg did an awesome job with the angle he took about the trip. The unsung heros are the cameramen. I met, and photographed, Anthony as he was filming me in Austin. I met Mike Daly during the interview with Ron. That night at the game, Mike had been working since 2 a.m., but he wanted to make sure he got footage of me at the game. I sincerely thank them all for their support and taking an interest in the “Baseball in America Tour 2014”. 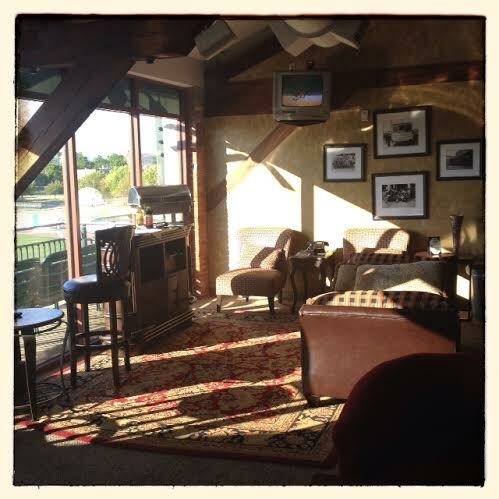 Inside one of the “old” luxury boxes! I promise that I will stay humble during all of this, I simply look at it as my “15 minutes of fame”. Every day I wake up and realize how lucky I am to be able to do this. I feel so fortunate that all of you are taking an interest in what I am doing, and your support, also. I so enjoy meeting all the different personalities. I know I keep bringing it up; but, this gratitude is a daily occurrence. Anyway take a look at the new stuff I put on the Home page of the website. If you didn’t know, I have included a page that lists all the games I have attended and the outcome. Roger Wilson, who handles the Buddha Travels page, maps out where I have been and where I am going.